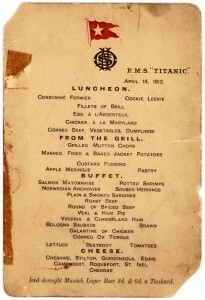 Cookson Adventures has offered a trip that includes a dive to the wreck of the Titanic plus a recreation of the wine-paired dinner served to those in first class on the ship’s fateful maiden voyage. Available for nine people and taking place in July 2019, Cookson said that the trip was a rare opportunity to take part in a manned dive to the wreck of the Titanic, which lies 3,800 metres below sea level on the bed of the Atlantic. While the dramatic and tragic scenes played out on the Atlantic Ocean, thousands of miles away a one-legged radio enthusiast in Blackwood was sat at his desk listening in. Artie Moore was one of the first people in the world to hear the terrifying message and although the story of the Titanic is known the world over, his role has been mostly lost to history. After the messages stopped Artie ran to the local police station to relay the news. With the Titanic being widely regarded as unsinkable and one of the most advanced ships ever built, the police laughed in his face. Maury Yeston and Peter Stone’s musical, told from the perspective of several characters aboard the fated vessel, won five Tony Awards when it premiered on Broadway in 1997, including Best Musical. “After such a wonderful UK and Ireland tour last year, I am delighted that the great ship is sailing again both in the UK and across Europe,” Yeston said. Titanic will make stops in Woking, Munich, Mannheim, Cologne and Moscow. Tickets are available at TitanicTheMusical.co.uk. “I’d look out my bedroom window and I could envision the Titanic out there,” said Scully. So to honor the ships legacy, Aidan has cut replica crystal goblets to the exact White Star Line design.And with any $40 or more purchase, customers are entered into a drawing to win two of these White Star Line goblets to take home. He has also just finished recreating a crystal bowl design served from on the Titanic as well. A newly surfaced personal artifact of a Titanic survivor is on display at the Titanic Museum Attraction in Pigeon Forge before it goes to auction. Titanic survivor Helen Candee had two personal items on board the famed ship when it sank. She met another passenger and, believing he would survive before she would, she gave them to him. His body was recovered later, and her items were returned to her family. 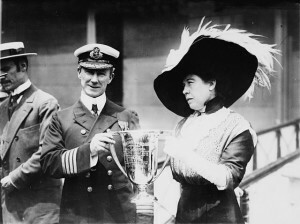 Mrs. J.J. “Molly” Brown presenting trophy cup award to Capt. Arthur Henry Rostron, for his service in the rescue of the Titanic. Items that once belonged to the “Unsinkable Molly Brown” are now on exhibit at the Titanic Museum Attraction in Pigeon Forge. The museum also is showing a 1912 loving cup that Brown gave Carpathia Capt. Arthur Rostron in thanks for saving her and 711 other Titanic survivors. That cup is on exhibit until March 30. The cup belongs to Rostron descendants and will be auctioned in Boston on April 24. At that time, bidding is expected to top $200,000. A Chinese firm plans to spend US$165mil (RM551.26mil) building a full-scale replica of the Titanic as the main attraction for a theme park. Little known Chinese energy company Seven Star Energy Investment said the replica, which is expected to cost 1 billion yuan (US$165mil), will be the main attraction for a planned theme park located at Sichuan, a landlocked province famous for its spicy food. Construction of the ship, which is 270m long, is expected to be completed in two years and will be based on designs of the Titanic’s sister ship, RMS Olympic, which was in service from 1911 to 1935, the SCMP reported. It is Titanic authors week at Titanic Museum in Pigeon Forge, Tennessee. The 7 day booksigning event will allow museum visitors to meet authors, have photos taken with them, and purchase books. The event is being held in the parking lot from 10am-5pm each day. It is free to attend and purchase of books will give a discount on museum admittance. The youngest author is Luke Copas, age 11, who wrote Facts For Kids About The Titanic. Other noted authors to be present are Daniel Allen Butler, Bruce M. Caplan, Kristen Iversen, Tammy S. Knox, Yvonne Lehman, June Hall McCash, Lee W. Merideth, Ken Rossignol, Julie Hedgepeth Williams,and Allan Wolf. Just a few items before I take time away for Thanksgiving. The folks over at Pigeon Forge are once again going all out for Christmas. On 22 November the Christmas season kicks off with snowfall off Titanic’s bow, a visit from Father Christmas, and fireworks. More snowfall and a visit from Father Christmas is scheduled for 22 and 24 Nov (both @ 7p.m.) Each December Saturday will also have the snowfall and Father Christmas. A new Titanic exhibit featuring a little known link to the Biltmore house in Ashville, North Carolina is also featured. 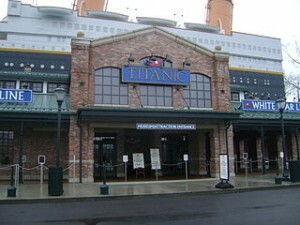 More information about Christmas schedule and other things can be found at www.titanicpigeonforge.com. Have a nice Thanksgiving everyone.